Capsule wardrobes have been a favorite topic of mine since I first got my hands on a copy of Nancy Nix-Rice's Looking Good: Wardrobe Planning and Personal Style Development, It was the mid nineties and I was a beginning teacher. The book was from inter-library loan. I photocopied the worksheets and sent the book back. I designed my first capsule by drawing little clothing diagrams on Paint, printing them out and coloring with colored pencils. I still have them, but they are missing at the moment. I know I've seen them this summer, but when I went to look I couldn't find them. If they turn up, I'll scan a couple. I've had lots of different capsules and formats for designing them in the last eighteen years. At one time, I drew all my clothes on index cards and used that to organize them. For the past year I've been using Go Chic or Go Home as a wardrobe organizer. I'll include a couple of screenshots since you have to join the site to see how people are using it. Membership is free. 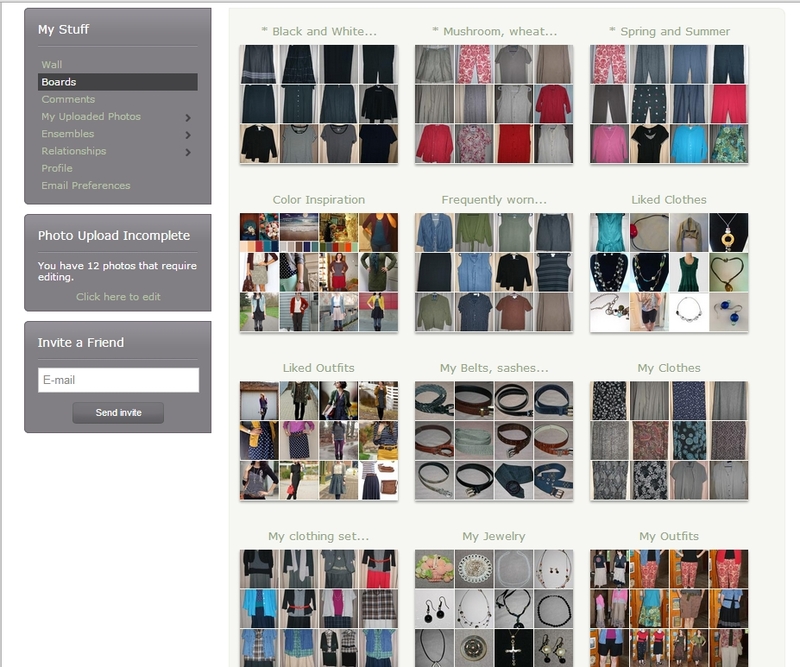 GCOGH is a powerful online database tailored to wardrobe organization. It's also a social network site if you want to participate in that aspect of it you can comment on member's outfit and garment photos and start question threads. 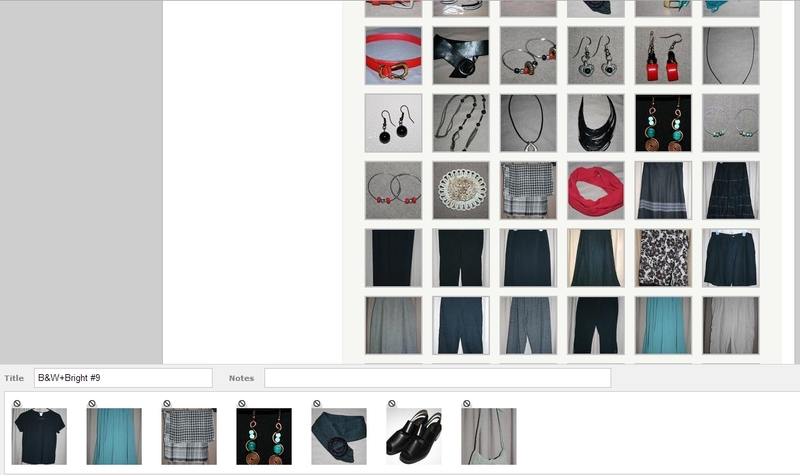 Basically, you take photos of your clothes and accessories or grab them from clothing store sites and upload them onto boards. How you organize those boards is limited only by your imagination. I have made boards for capsule wardrobes, accessories, clothing sets, selfies in my different outfits, frequently worn garments, inspiration and even sewing patterns. I'd like to add a sewing stash board, but it hasn't happened yet. 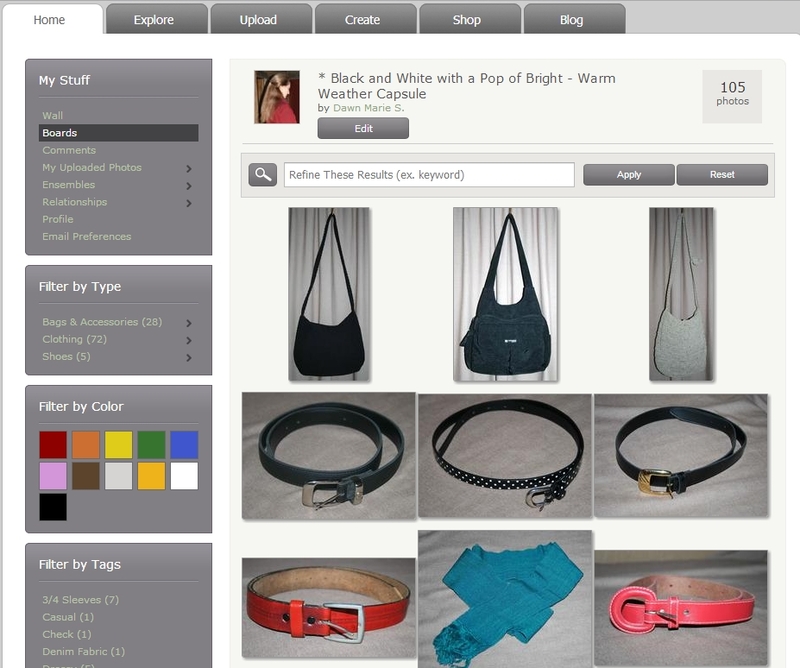 Like all good databases, you can search through your boards based on color, garment type, or key words you have placed in the title or notes for each photo. Once you have some photos on boards, you can start creating ensembles. I like to make ensembles of outfit ideas and then when I wear the outfit, I add a photo of myself in it. If I were sewing more, I would use the ensemble feature to put together fabric, patterns and inspiration shots for the garments. 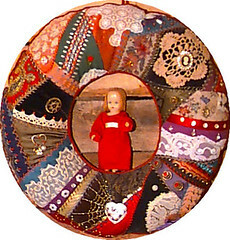 As it is, it's nice not to have to go upstairs and drag out my patterns to see what I have. Thanks for the reminder. I joined this site and totally forgot about it. I went back today and it will be very helpful to build outfits.